This article is about the city in the Philippines. For the country in Central America, see El Salvador. El Salvador, officially the City of El Salvador, (Cebuano: Dakbayan sa El Salvador; Filipino: Lungsod ng El Salvador), or simply referred to as El Salvador City is a 6th class city in the province of Misamis Oriental, Philippines. According to the 2015 census, it has a population of 50,204 people. The city serves as a pilgrimage site for Divine Mercy devotees, that is why it is also called the City of the Saviour, City of Mercy, and the Divine Mercy City of the Philippines. 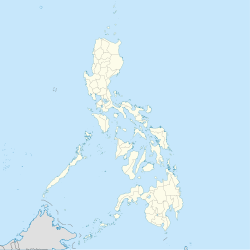 El Salvador is located in the Province of Misamis Oriental in Northern Mindanao (Region X). It is bordered by the Municipality of Alubijid to the west, Opol to the east and Manticao and Naawan to the south. On the north, lies Macajalar Bay of the Bohol Sea. Administratively, El Salvador is subdivided into 15 barangays. One forms the center of the city (poblacion) whereas the other 14 are in the outlying areas. Some of them are even several kilometers away from the center of the city. Hinigdaan was a ranch during the Spanish periods the areas covers the parts of Kalabay labay where the DJango's have 300 hectares of land and hundreds of cows..the area was famous of cattle ranching towards the areas of Tugasnon alubijid to Lourdes where the first Municipality was located now transferred to Alubijid and Sikitun of Gitagum Misamis Oriental. During the 11th Congress (1998–2001), Congress enacted into law 33 bills converting 33 municipalities into cities. However, Congress did not act on a further 24 bills converting 24 other municipalities into cities. During the 12th Congress (2001–2004), Congress enacted into law Republic Act No. 9009 (RA 9009), which took effect on 30 June 2001. RA 9009 amended Section 450 of the Local Government Code by increasing the annual income requirement for conversion of a municipality into a city from ₱20 million to ₱100 million. The rationale for the amendment was to restrain, in the words of Senator Aquilino Pimentel, "the mad rush" of municipalities to convert into cities solely to secure a larger share in the Internal Revenue Allotment despite the fact that they are incapable of fiscal independence. After RA 9009 went into effect, the House of Representatives of the 12th Congress adopted Joint Resolution No. 29, which sought to exempt from the ₱100 million income requirement in RA 9009 the 24 municipalities whose cityhood bills were not approved in the 11th Congress. However, the 12th Congress ended without the Senate having approved Joint Resolution No. 29. In November 2008, El salvador and 15 other cities lost their cityhood after the Supreme Court of the Philippines granted a petition filed by the League of Cities of the Philippines, and declared unconstitutional the cityhood law (RA 9876) which had allowed the town to acquire its city status. The Supreme Court ruled that they did not pass the requirements for cityhood. But on 27 August 2010, the 16 cities lost their city status again, after the Supreme Court voted 7-6, with two justices not taking part, to reinstate the 2008 decision declaring as "unconstitutional" the Republic Acts that converted the 16 municipalities into cities. A previous law required towns aspiring to become cities to earn at least ₱100 million annually, which none of the 16 did. On 28 June 2011 the Supreme Court directed the Clerk of Court to issue the entry of judgment on the cityhood case of 16 municipalities. El Salvador hosts several companies, plants and factories west of Misamis Oriental. These are Asia Brewery, Tanduay Rhum, Virgin Cola Bottling Plant (Visayas and Mindanao region distributor), Highland Fresh Daily Products, Monark Equipment, The Aoso, Zest-O Corporation, WL Foods Corporation, Universal Robina Corporation and Union Plywood Corporation. With regards to financial institutions, Rural Bank of El Salvador and lending institutions such as FICCO, Oro Coop, M Lhuillier and others are accessible at office hours in this place. Divine Mercy Shrine, located in PSB-Ulaliman El Salvador. Divine Mercy Shrine (Misamis Oriental), located in the Divine Mercy Hills, PSB-Ulaliman which is overlooking Macajalar Bay. The shrine has a 50-foot statue of the Divine Mercy Christ, the biggest in Asia. It serves as a pilgrimage site for the Divine Mercy devotees. As a pilgrimage and sacred site, visitors are not allowed to wear shorts and other revealing clothing. Those who do so will be forced to cover themselves with a blue cloth provided by the shrine administrators. Burias Island, located just a few kilometers off the coast of Molugan or about 3 km west of the town of Opol. Our Lady of Snows Parish Church, newly constructed church located within the city. Abaga & Sikiop Falls, Located in barangay San Francisco de Asis. Tag-ilas Falls, Located in barangay Hinigdaan. Tuburan Spring, Located in both barangays Taytay and Poblacion . El Salvador city can be reached via plane through Laguindingan Airport, then about less than 10 minutes bus ride east. Like any other place the national highway snakes through it. Visitors and locals can go around the city by just hailing a "sikad-sikad" or motorboat, "jeepneys" or motorcycles to the outlying barangays. PLDT and MISORTEL are among the major phone lines, also transmitters or "cell sites" for all major "telecom" providers like Globe, Smart and Sun Cellular are serviceable in this city. Internet access is also available. Internet cafes can be found in various places in within the city. Broadband service is also available. Department of Public Works and Highways (DPWH) 2nd DEO Misamis Oriental. ^ a b c Census of Population (2015). "Region X (Northern Mindanao)". Total Population by Province, City, Municipality and Barangay. PSA. Retrieved 20 June 2016. ^ "An act creating the municipality of El Salvador, province of Misamis Oriental". LawPH.com. Archived from the original on 2012-07-10. Retrieved 2011-04-08. ^ Napallacan, Jhunex (2008-11-21). "Cities' demotion worries DepEd execs". Cebu Daily News. Inquirer.net. Retrieved 15 February 2015. ^ a b Republic Act No. 9009 (24 February 2001), An Act amending section 450 of Republic Act no. 7160, otherwise known as the Local Government Code of 1991, by increasing the average annual income requirement for a municipality or cluster of barangays to be converted into a component city. Wikimedia Commons has media related to El Salvador, Misamis Oriental.